Mother's Day is just around the corner, as I'm sure most are already aware. We've been inundated with commercials from florists, jewellery stores, and every other marketer for weeks now. The only thing that will stop the buy-buy-buy messages is actually arriving at Mother's Day. Then we'll be treated to another round of marketing mania for Father's Day. But that's another post. For the past week or so my mother has been in the forefront of my mind. Probably not for the reasons you're thinking, though. My mother died more than 18 years ago. I don't think of her all that often. But the most wonderful thing is that I'm not angry at her either. I haven't been in a lot of years. The reason she's been on my mind lately is that I have come to a place where I appreciate all that I came to be as a result of her being in my life as my mother. This may be difficult for you to understand. Particularly if you went through a great deal of adversity growing up. 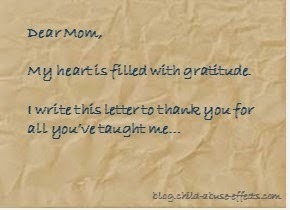 But no matter what was done to me as a child, no matter how many times I wanted to take my own life as a result, today I write this letter to you, Mom. I am grateful for all that you taught me, directly and indirectly. You inspired me in ways neither of us would ever have dreamed possible. 1. Thank you for teaching me that we all have to make choices in our lives and that there are consequences to those choices. 2. Thank you for teaching me that no matter how much emotional pain I am in, I can find a way to deal with it. When you were so challenged to find your own way, you inspired me to find healthy ways for myself. And not just on my own, but with the help of others. 3. Thank you for teaching me that physical pain can be a state of mind. 4. Thank you for teaching me that I am capable of finding what I need and then giving it to myself. Again, not just on my own, but with the help of others when I need it. 5. Thank you for teaching me that I am smart and capable of learning anything I set my sights on learning. When you repeatedly told me how stupid I was, you awakened in me an attitude that I'd prove you wrong. And though I no longer need to prove you wrong, I needed to then. Now I'm left with a powerful belief that I really can do anything. 6. Thank you for teaching me that when things got really tough as a result of uncontrollable anger and hostility, "this too shall pass", even for just a short time. You stirred in me a robust desire to find a better way for my own life than all the turmoil and anger and hatred. 7. Thank you for teaching me to work hard within an almost impossible standard, because I now get such a deep sense of accomplishment whenever I do a job well. 8. Thank you for teaching me that I couldn't finish anything I started, because what you did with that constant message was impel me to adopt an I'll-show-you determination. I take such pride in finishing what I start, but not to show you anymore, Mom. To show myself I can do it. 9. Thank you for teaching me that I must step up when a person is hurting another. Your uncontrolled emotions and actions developed in me a very passionate awareness of right and wrong. 10. Thank you for teaching me that I would never find love for myself and for teaching me how miserable it is to live in an unhappy unhealthy marriage. Your anger motivated me to find love and to keep it in my life. And even when you tried to destroy the loving marriage my husband and I created, all the other lessons you taught me, 1 through 9, came into play. So as we approach Mother's Day this Sunday, I continue to say thank you for all that you taught me, good and not so good. Because had you not taught me in the way that you did, I would not be the advocate I am today. I would not be on the adventure I am on today. I'm filled with love and gratitude for you, Mom. You did your best. I know and understand that. And your best was more than just good enough. It was perfect. I'm not ready to do this and I don't know if I ever will be ready but it's an interesting concept. Darlene you're a bigger person than I am. I don't think I'll ever forgive and I don't think I'll get to the place you are now. I like this article but I'm with the other 2 Anons. I don't think I could do this. I bow to you Darlene for being able to do this.